Close view of a small ruined temple, Dhaknesar, Jhansi District. bl.uk > Online Gallery Home	> Online exhibitions	> Asia, Pacific and Africa Collections	> Close view of a small ruined temple, Dhaknesar, Jhansi District. 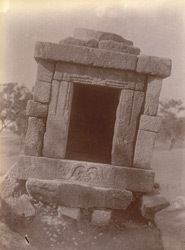 Photograph of an entrance to a shrine at Dhaknesar, Jhansi District, part of the Archaeological Survey of India Collections: Indian Museum Series, taken by an unknown photographer in the 1890s. The district of Jhansi in Uttar Pradesh was ruled by a succession of dynasties under several different names, the most noted being the Chandella kings who ruled from the 9th to the 12th centuries. The majority of the Hindu and Jain temples that remain date to this period. The area was renamed Jhansi in the 17th century when it rose to power under the Raja Bir Singh Deo of Orchha, who built the fort in 1613 that the city was named after. Historically, Jhansi is often remembered for the young patriotic queen Lakshmi Bai, also known as the Rani of Jhansi, who became a national symbol of resistance to British rule.